Organisers of an Aberdeen visual arts and design festival have revealed that Assemble (recent winners of the Turner Prize) with artist Simon Terrill – will headline its annual event in the Granite City next month. 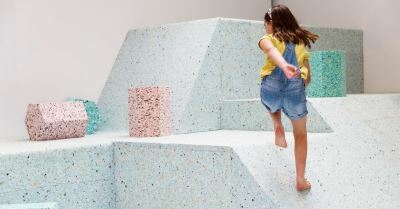 They are delighted to be working with the Royal Institute of British Architects (RIBA), which commissioned Assemble and visual artist, Simon Terrill’s Brutalist Playground, now set to launch its UK tour at Aberdeen’s Look Again Visual Art & Design festival. It is the first time the interactive sculptures, inspired by Britain’s post-war brutalist designed playgrounds, will be seen outside London and will include a new piece, referencing an area of Aberdeen. Look Again, spearheaded by Robert Gordon University (RGU) and Aberdeen-based art agency SMART, takes place from Thursday, April 28 to Monday, May 2. The five-day event is part of Scotland’s Year of Innovation, Architecture and Design 2016 – an initiative delivered by VisitScotland – and includes a diverse programme of exhibitions and events across the city. Sally Reaper, Look Again Visual Art & Design festival director, said: “We are incredibly excited to work in partnership with RIBA to welcome Assemble and Simon Terrill to Aberdeen’s Peacock Visual Arts to showcase their work. Attracting such acclaimed talent to Look Again underlines our commitment to creating a thriving, creative culture in the city – one that leaves a lasting legacy and, that plays a critical role within our communities and economy. Principal of RGU, Professor Ferdinand von Prondzynski, said: “The reaction to last year’s Look Again festival was fantastic and showed that there is a real appetite in the city for this type of event which celebrates visual art and design. 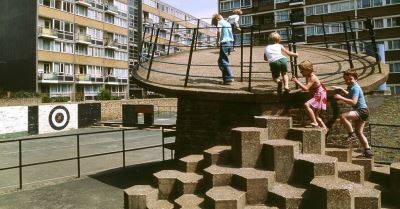 Brutalist playgrounds were built at the foot of high-rise tower blocks. Remnants can still be seen in Aberdeen and in cities across the UK. Now, largely replaced by more modern playgrounds, Assemble and Simon Terrill’s installation pieces are a comment on the designs, the playground and on contemporary play as well as the dramatic shapes and harsh materials that were used to build these children’s play parks. As part of the 57 10 Lecture Series, organised by students at RGU’s Scott Sutherland School of Architecture and Built Environment, a member of Assemble and Simon Terrill will give a public lecture on Thursday 28 April. Following the collective’s exhibition in Aberdeen, the Brutalist Playground installation will continue its tour to Sheffield in June 2016. Debuting in 2015, the Look Again festival celebrates the very best of visual art and design. It aims to challenge the way we see the Granite City and put the North-east of Scotland on the map as a centre of excellence for innovative and imaginative projects. Sponsorship opportunities for the Look Again festival are still available. For details please contact Sally Reaper, Look Again festival director at sally@wearesmart.co.uk.